Cirton Plumbing & Drain Ltd. Reviews for Cirton Plumbing & Drain Ltd.
We had a blocked kitchen sink in the middle of holiday cooking. We called Mike and he showed up within an hour of calling. He fixed the clog and had to replace a piece of pipe. We highly recommend Citron plumbing for great work and fair pricing. Thanks again Mike. Thankyou for the review. 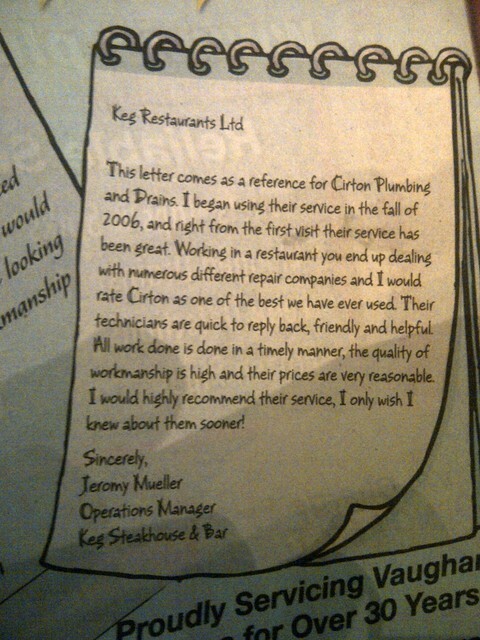 it's our pleasure. I tried to fix a leaky kitchen faucet but didn’t have the tools (skills) to finish it. Called Mike at 12pm and he arranged for Angelo to come and fix the faucet between 2 and 5. Angelo called to finalize a time and was right on schedule. Got the job done professionally and with an great sense of humour at a fair price. Thank you Sarah I'm glad you are happy with the service. Fast and knowledgeable, explained what he was doing and how to prevent the next time. On time, efficient, appropriate pricing, friendly and clean. Not the first time we’ve called Cirton for a reason. Would highly recommend Angelo and Cirton Plumbing. The author is editing their review. Angelo fixed the cold water valve in the laundry room, as it wasn't stopping and therefore unable to close. Replaced valve ,checked toilet to make sure it was functional. Very professional and he knew the product well. Quick and effective service. Serviceman opened the rain pipe to find stuck material n the pipe, emptied it , assembled pipe back , tested the drainage to see it worked . Job done. Angelo and Mike were courteous and helpful; they wanted to ensure we were completely satisfied and that the issue was resolved. Great job. Professional, clean and quick. Explained what the issue is in detail , left some tips so that it doesn’t happen again. Thank you for the review. I'm glad you are happy with the service. Mike. 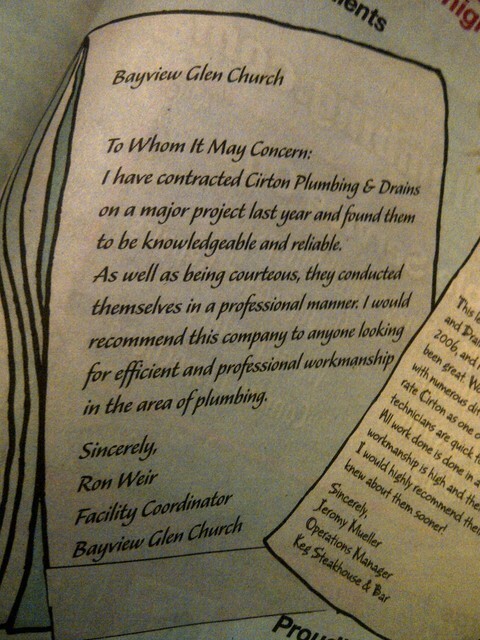 More about Cirton Plumbing & Drain Ltd. Plumbing Service Company serving the York Region for over 30 years. "WE CHARGE BY THE JOB NOT THE HOUR"